We’ve just finished with All Saints’ Day, and we’re technically into All Souls’ Day. I’m not sure what comes after that, but All Snacks Day would be nice. Basically, the end of October and beginning of November marked the beginning of winter and were viewed as a time when the barrier between the worlds of the living and the dead was weakened. In their general tradition of adapting pagan holidays in a way that removes the pesky nature worship, the Christian Church kept the idea of honoring the dead in a different way. 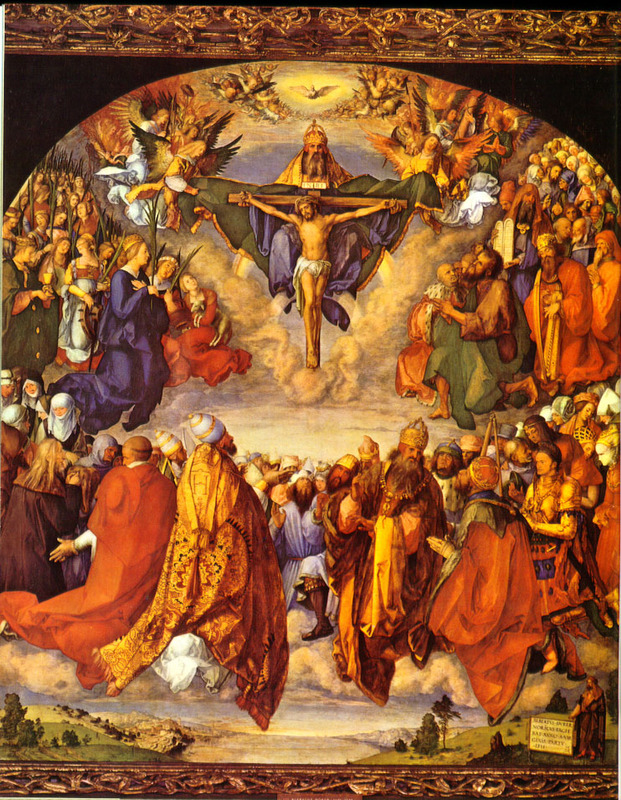 All Saints’ is dedicated to the saints who don’t already have their own feast days, and All Souls’ is about praying for the souls of other faithful Christians. So how does someone get to be a saint? Well, the word can be used pretty generally. It essentially means an exceptionally holy person, and is sometimes used for religions other than Christianity. In Roman Catholicism, however, there are some rather strict requirements for being an official saint. For one thing, you have to be dead. Well, except for St. Michael the Archangel, I guess, but that’s more of honorary title for him. Also, you have to have performed two posthumous miracles. Any miracles you performed during your lifetime presumably don’t count. This is a rather recent requirement, however, and many saints are recognized without this. The first people to be considered saints were the martyrs. Being martyred was basically considered a free ticket to Heaven in the early Church, so it became quite popular. Nowadays, though, you don’t come across all that many Christian martyrs, so the list of official saints began to include confessors, who were people who lived exemplary lives and did a lot of service for the Church. Most early saints were chosen through popular acclaim, and in a way they still are, because I’m sure the Pope can come up with some sort of miracle if a person is popular enough. Canonization became the privilege of the Pope in particular in the twelfth century. The Church is careful to say that saints aren’t really worshipped, but from a layman’s perspective, they sort of are. Officially, their role is to serve as intercessors between humanity and God, I guess because the Almighty is too busy to listen to all the prayers himself. It sounds like, if you live a good life, God makes you a permanent administrative assistant in Heaven. While some polytheistic religions have patron gods for specific people or general professions or ideas, Catholicism has patron saints. Not too much different if you ask me, but nobody has. There are apparently over 10,000 Catholic saints, so obviously they can’t all have their own days. That’s why we have All Saints’ Day, when all the others get to share a cake. I wonder if there’s any jealousy of the famous saints going on. I guess if they’re all perfectly holy there wouldn’t be, as envy is a sin. This entry was posted in Catholicism, Christianity, Holidays, Religion and tagged all saints day, all souls day, canonization, confessors, heaven, martyrs, miracles, saints. Bookmark the permalink. Good article, Nathan. In my estimation, the whole “intercessor” thing, which applies to saints, Mary and the priesthood is one of the bigger violations of scripture that most organized religions (not just the Catholic Church, though they were the first and most overt) are guilty of. That one scripture alone invalidates the need for any kind of priesthood or governing body, and precludes the use of saints or Mary in worship. More importantly, however, it underscores the idea that Jesus didn’t intend to replace Judaism with a new religion, but to replace religion with relationship. Contrary to how the Right Wing has hijacked and perverted Christianity, or how the CC “Christianized” a pagan model, Jesus is the sole intercessor/mediator between God and man (collective), and between God and the individual. And that means no man or body has the authority to dictate to anyone else because there is no clergy/laity distinction made in the New Testament. Christian society was designed with an egalitarian model in mind, with older, more mature ones helping to oversee, guide and care for the community, and particularly the most victimized and vulnerable in society, widows and orphans. I definitely think the idea of intercessors is part of a compromise with pagan religions that were popular when the Church was being established, sort of like how veneration of Mary is prominent in cultures that had strong mother goddess figures. The idea of intercessors is somewhat appealing in the idea that, if you don’t succeed with one saint, you can always try another. Of course, if God is ultimately good and all-powerful, it shouldn’t be necessary. Well-said! It also keeps people dependent on a hierarchy. Rather than take responsibility for one’s own spirituality (and that of one’s family), the individual is kept infantilized by relying on others to spoon-feed him once a week (or several times a week as is the case with some high-demand religions). That’s not to say this is true for EVERY religion or even for members of hierarchical religions. I know several Catholics who are very invested in their own spiritual development, and a are great human beings. But as a whole, having a direct, one-to-one relationship with God (through Christ) means there is no following along with the crowd, no deflecting responsibility unto so-called superiors, no putting on the pretense of righteousness to impress others. So, yeah, I can see why the pagan model was so appealing. Mysteries, rituals and traditions can have meaning, but more often than not they become crutches, and at worst, hollow substitutes for the work that it takes to genuinely transcend into better human being who reflect God’s love. Becoming spiritually, psychologically and emotionally whole is a challenging endeavor, a recognition that one’s development is a constant work-in-progress, that growth requires painstaking honesty, humility, and the yearning hunger to learn and adjust one’s perceptions and attitudes. If organized religion isn’t aiding the individual (and, thus the community) towards such an endeavor in love, then it’s ineffectual and dead, and if it produces the opposite — intolerance, rigidity, small-mindedness, elitism, fear, self-righteousness, dependence on a human organization — then it’s false religion. I heard a homily a few years back on All Saints’ that All Those Saints weren’t really just some stuffy perfect dead religious people, but actually it was EVERYbody, or, the good in everybody– the POTENTIAL. Kind of a seeing-Christ-in-everyone-you-meet way of looking at it. I mean, this may not be the strict Catholic DOCTRINE on the holiday, but it’s apparently an acceptably-enough-for-a-Catholic-homily way of APPLYING the idea into your own life. Also, this kind of overlaps to where I, as a practicing Catholic, see the difference between “worship” and “asking for intercession.” Saint-directed “prayers” are actually more just, like, having a chat with someone who’s gone before– not much different than, actually not different at all from chatting with a dead relative or friend. If a saint is a particular saint of Something, it’s like, “I figured I’d talk to you because you obviously have some experience with this issue.” If I can make a personal admission here, I’ve actually been “praying” to Diana Wynne Jones a lot in the past year– funny because she was an atheist, but I still somehow feel like she can hear me and she understands– she’s my Patron Saint of Wild Imagination. It’s really just like talking to an invisible person, though– a mentor you just happen to not actually have beside you physically. Whereas worship… to worship God is to feel something so much huger than yourself, to surrender yourself to that Power. You can chat with that Power, too… but it’s never JUST chatting.